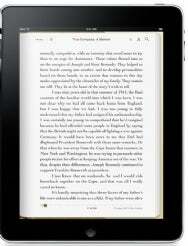 Can the iPad compete as an e-book reader? Shortly after Steve Jobs unveiled the iPad, I wondered whether the device—awesome as it seems—would truly compete as an e-book reader. Now that you can pre-order the long-awaited device, Apple has spilled a host of new details about the iPad, with some particularly interesting revelations relating to iBooks—so it’s time to revisit my early concerns. As I wrote in January, I’m a content Kindle 2 owner, and I don’t feel any eye fatigue even after reading the Kindle for hours. Reading on the iPhone with the Kindle app is pleasant, but I can only do so for relatively short stretches before my eyes start to ache from the bright, backlit screen. While the iBooks interface looks stunning, I don’t relish the notion of reading on those virtual white pages. Apple’s new marketing page for iBooks makes reference to an option to “adjust the backlight brightness to read in low light.” Now, that could simply mean “quit iBooks, launch the Settings app, tweak the brightness settings, go back to the home screen, and launch iBooks again,” but I have to hope that Steve Jobs and company have a smoother, in-app process in mind. Apps like Kindle and Stanza offer white-on-black reading as an option for reading in darker rooms, and that helps a lot in preventing retinal anguish if you read in bed before falling asleep. Apple’s new marketing text, while vague, gives me hope that iBooks will do the same. Speaking of reading in bed, anyone who’s attempted to check e-mail on an iPhone while lying down has encountered the dreaded Screen Dance of Pain. You know the drill: The iPhone’s accelerometer can’t decide which way is up, and the screen rotates back and forth while you’re trying to get stuff done. Many apps, including the existing e-readers, offer custom “locking” mechanisms to prevent the screen from rotating, but it’s implemented differently and inconsistently. Quoting myself from January, “I think the iPad will need such a feature system-wide (you won’t want other apps flipping on you either), but it’s an absolute must for iBooks.” I am thus thrilled to report that Apple’s newest marketing materials show a hardware button on the iPad that will indeed allow you to lock the screen’s orientation. I think that’s a must-have feature, and a real, tactile switch was definitely the right way to go. That’s one worry I can cross off my list of initial concerns about the iPad as an e-reader. Another item on my iBooks wish list was some version of the surprisingly-useful Kindle feature that lets you see the definition of any word in the book you’re reading. The latest word for Apple declares that you’ll be able to “touch and hold any word to look it up in the built-in dictionary or Wikipedia.” That bests the Kindle; touching instead of slowly cursoring to the word is obviously much more intuitive and much less tedious. Two more just-announced features also please me greatly. The first is Apple’s public pronouncement that “you can add free ePub titles to iTunes and sync them to the iBooks app on your iPad.” Oodles of books are in the public domain (and oodles of folks will happily charge you needlessly to deliver them to you in electronic formats). But thanks to Apple’s embracing of ePub and services like Project Gutenberg, you’ll be able to get public domain e-books onto your iPad freely—which is great news. On the interface side, I find the presence of a small “list-view” button in iBooks reassuring: my Kindle is currently loaded up with 75 books; as lovely as the bookshelf view in iBooks is, I expect it would handle a heavy book load even worse than a cheap Ikea bookcase. The ability to switch from the pretty interface to a more utilitarian view is welcome. One additional new announcement from Apple regarding iBooks touts the fact that “it can read you the contents of any page” with VoiceOver. The Kindle famously offers that semi-creepy robo-reading feature, too—but early publisher complaints about cannibalizing audiobook sales forced Amazon to make this concession, right on the Kindle’s main page: “With the experimental Text-to-Speech feature, Kindle can read English newspapers, magazines, blogs, and books out loud to you, unless the book's rights holder made the feature unavailable” (emphasis added). Apple states no such caveat—yet. Overall, though, I’m delighted by all of Apple’s latest iBooks details. It’s still impossible for me to tell whether I’ll be ready to pass my Kindle on to another family member in favor of the iPad—but it’s looking a lot more likely now than ever before.